When making fashion sketches, you have to draw the arms in proportion to the rest of the body, or your drawing will look very off-balance. A common beginner’s mistake is to make the arms too short, so use the correct head count. Arms should be 2-1/2 heads long, not including the wrists and hands. The elbows should line up with the waistline, about 3 heads from the top. Use your stick figure proportions as a guide to find the correct arm lengths. At the end of each shoulder line, lightly pencil in two cylinders for the upper and lower arms. A circle between the two represents the elbow. The length of the upper arm is about 1-1/2 heads, and the forearm is about 1 head long. End the first cylinder at the elbow, which is across from the waistline. The waistline is 3 heads down. 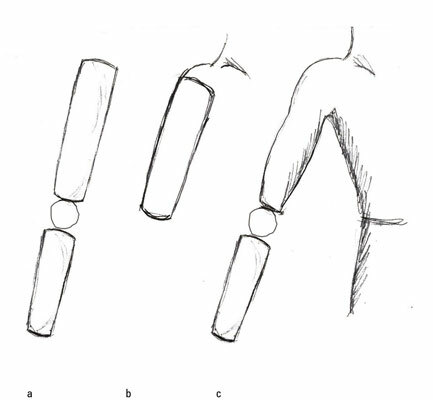 The second cylinder ends arounds the top of the thigh (or 4 heads down) and tapers down to where the wrist and hand begin. Turn the sides of the cylinders into gentle curves to represent the muscles.